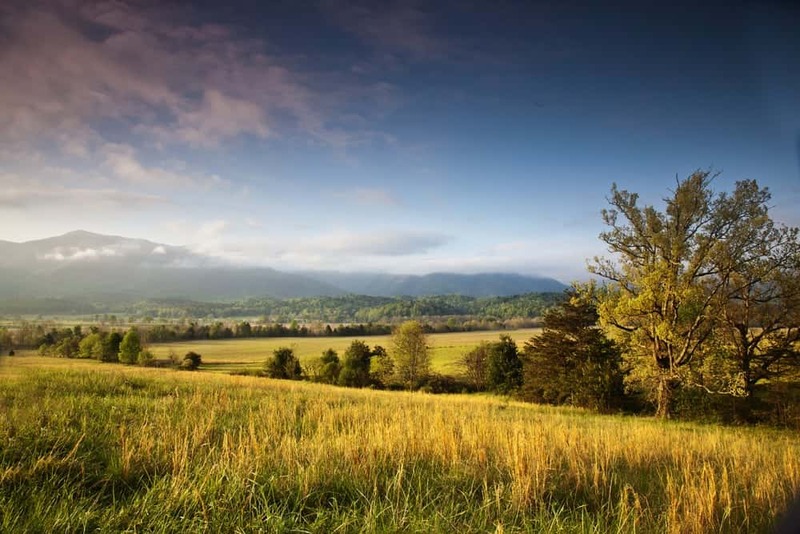 Cades Cove is one of the most beautiful locations in North America, making it a highly sought after wedding location. Planning a Cades Cove wedding comes with a number of regulations and restrictions, but having this breathtaking section of the Smokies as the backdrop for the happiest day of your life is completely worth it. To help you begin, we have put together a convenient guide with everything you need to know about getting married in Cades Cove. Planning a wedding in Cades Cove requires a lot of coordination with the National Park Service. Everyone who gets married in the Great Smoky Mountains National Park needs to apply for a Special Use Permit. A $50 non refundable fee is required with the application, and applications must be received at least 14 days prior to the wedding (although we suggest applying much earlier). You can find the official application for the Special Use Permit here. If you have any questions about the permit, you can call the National Park Service at 828-497-1930. If you will have a professional wedding planner, photographer, videographer, limousine driver, or any other commercial service at your Cades Cove wedding, all of these businesses need a Commercial Use Authorization. Make sure that your wedding service providers have CUAs before you hire them! Typical wedding permits allow for a maximum of only 6 cars and 20 people, including the minister and photographer. Exceptions to this rule are considered on a case by case basis. Certain locations allow for more people and cars, depending on the parking situation. Be sure to detail your transportation plans in your application. From the Friday before Memorial Day through Labor Day, weddings must take place after 11 a.m. and must end before 6 p.m. The Cades Cove loop road is closed to motor vehicles until 10 a.m. on Wednesdays and Saturdays from early May through late September. On these days, wedding services will not be scheduled before 11:30 a.m. in order to avoid traffic congestion. Outdoor ceremonies are limited to one hour (including setup, photography, and cleanup) and services in historic buildings are limited to 90 minutes. 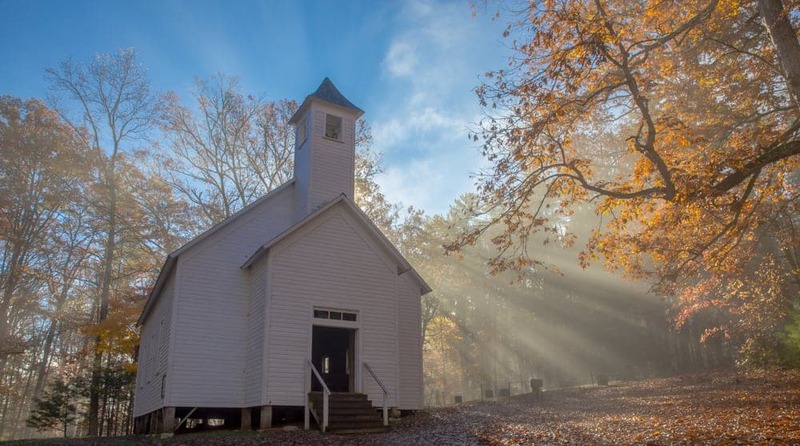 Historic churches and cabins in Cades Cove are not heated and do not have electricity. No more than two weddings can be scheduled for the same location in one day. Weddings must end at least one hour before sunset so guests have time to exit the Cades Cove loop before it closes. October is peak season for traffic in the national park. Due to this, the designated locations for weddings in Cades Cove are limited to Monday through Friday during the month of October. Furthermore, weddings must start between 9 a.m. and noon. Cades Cove Wildlife Overlook – located on the Cades Cove loop road, about a half mile beyond the Missionary Baptist Church. LeQuire Cemetery Overlook – located on the exit side of the loop road, roughly 0.3 mile beyond the Sparks Lane junction. There is a field available for use adjacent to the overlook. Methodist Church – maximum of 6 cars and 50 people. Missionary Baptist Church – maximum of 6 cars and 50 people. Primitive Baptist Church – maximum of 10 cars and 60 people. For information about Cades Cove’s location in relation to the cities of Gatlinburg and Pigeon Forge, Tennessee, check out our blog “Where is Cades Cove?”. Jason Fishman shares the latest news and travel tips for Tennessee's Great Smoky Mountains.